After the crucial contribution of the Human Rights Council to the UNGASS, the impact of drug policies – including on human rights – remains a global concern. 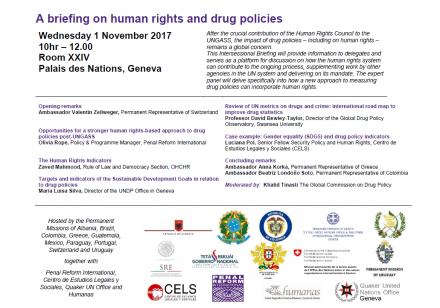 On Wednesday 1 November, PRI will co-host an intersessional briefing on human rights and drug policies together with the core group of member states working on this issue, namely, the Permanent Missions of Albania, Brazil, Colombia, Greece, Guatemala, Mexico, Paraguay, Portugal, Switzerland and Uruguay, as well as the Centro de Estudios Legales y Sociales (CELS), the Quaker UN Office and Humanas. The briefing will provide information to delegates and serve as a platform for discussion on how the human rights system can contribute to the ongoing process of ensuring that drug policies are aligned to human rights, supplementing work by other agencies in the UN system and delivering on its mandate. The expert panel will delve specifically into how a new approach to measuring drug policies can incorporate human rights. Opening remarks will be made by Ambassador Valentin Zellweger, Permanent Representative of Switzerland, and concluding remarks will be made by Ambassador Anna Korka, Permanent Representative of Greece, and Ambassador Beatriz Londoño Soto, Permanent Representative of Colombia. Speakers will include representatives of UNDP, the UN Office of the High Commissioner for Human Rights (OHCHR), PRI, the Global Drug Policy Observatory and CELS. Khalid Tinasti of the Global Commission on Drug Policy will moderate the event, which will take place in Room XXIV, Palais des Nations, Geneva, from 10.00am. Click here for full details on the intersessional briefing. Read more about PRI’s work on drug policy here.